I have been working here and there over the last few days on tying the baby quilt and sewing the binding on the Botanical ( previous post ) but I have several projects in progress …the beginning stages that is. 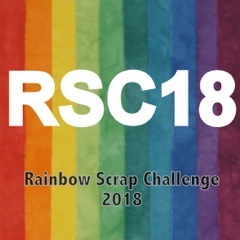 The Rainbow Scrap Challenge color suggestion of the month is purple or lavender or a mixture. I started prepping a Starflower in those shades. I finally got around to doing a little applique on an Elizabeth’s Pride block. Fabrics are pulled for some “Blend” blocks for my RSC piecing project this year. A basket in berry / purple shades is prepped. I have added two more connector pieces to the black and grey Starflower. Also in the previous post, I’d shown that Barb’s fan stencil had arrived. I’ve started using that on my Rose of Sharon hand quilting project. What I am doing, since I do not have the exact shades of quilting thread for the leaves, stems, and darker flowers, is I am using my regular thread in those sections. I do have a pink shade of quilting thread that I can use in the lighter flowers down the line. We’ve had a fresh round of ice, snow, and bitter temperatures so hand quilting and any quilting projects indoors works well with the weather here in Southwestern PA. Tagged hand quilting, Quilt Project : Rose of Sharon, Starflowers. Bookmark the permalink. that will take some time switching out colors of thread but in the end it should look nice – usually I just see people use one thread and go over all the applique which is not something I care for but seeing as it is never my quilt it doesn’t matter :) I hope it is not hard quilting over applique pieces. No snow for us still. Lots of great projects going on at your place! Your quilting looks lovely! have you ever tried loading multiple needs so you can do several lines at once, then move the hoop. I notice you have a cute crochet printed fabric. WOW. You are doing a Great hand quilting!!! The flower quilt in your hoop looks beautiful! Sounds like a good project for this time of year! My most peaceful moments are spent hand quilting in a hoop! I used to have a cable news channel on in the background, but lately I’ve been unable to bear it! This time has become perfect for praying for family and friends and the dire situation our country is in. Your hand quilting is so lovely. What do you use to mark your fan arcs? Hand quilting allows you to stop and switch threads so much more easily. The more subtle effect will work out nicely over the applique. Looks great so far. Your work is just beautiful! You are so talented! Blend? Looking forward to seeing what that looks like in PURPLE! Really love that little basket! The quilting looks terrific. Such a pretty block. I think I always just skipped quilting inside the appliqué shapes. You are much more thorough! Ick, cold and snow, but yay! quilting time with a warm quilt on your lap! You run circles around me! Beautiful work, Deb! Hello, you are keeping busy with your quilting projects. They are all beautiful. I thought of you when I picked out and read a book called the Goodbye Quilt. We are getting snow today but it is suppose to change to rain. Enjoy your day and new week! Time well spent on a chilly day. I absolutely love your quilting posts. I’m just a quilter wannabe. I recently did go purchase fabric to do a throw quilt for the guest room. Now mind you it won’t be hand pieced or hand stitched, probably more like Quilt-in-a-Day, but I’ll start with baby steps.